McMichael arrived in Chicago in 1981 following his release by the New England Patriots. 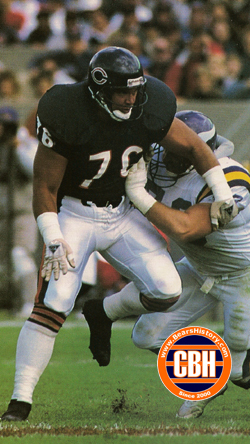 He probably wouldn't have even been a Bear if not for an injury to Bear defensive tackle Brad Shearer. Following 13 seasons for the Bears, no player in Chicago football history ended up playing in more games than McMichael's 191. The Texan that became known for his long hair and crazy antics didn't start a game until well into the 1983 season, but still tallied 2.5 sacks and rumbled 64 yards after a fumble during the 1982 season. He became a starter in '83, racking up 8.5 sacks that year and 10 as a full-time starter in 1984. McMichael made Pro Bowls following the 1985, 1986 and 1987 seasons. "Mongo" was still playing at a high level in 1993, when he served as a mentor for young players brought in by new coach Dave Wannstedt. But McMichael became a victim of the NFL's new salary cap in 1994, as more money from teams became devoted to younger players. After not being resigned by the Bears, he spent 1994 with the Green Bay Packers, starting 14 games.